i get %14 renewal with this code. Not sure about code. Special Savings! $4 COM with Free Privacy! 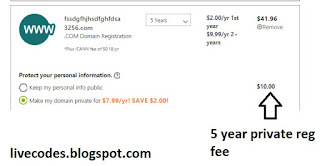 2.99$ first year + Free Private reg >> Currently Go daddy lowered the price of .Com domain to 2.99$ , this is why you see the price 2.99$.Go daddy automatically apply the best price for you. 14.99$ additional years + Free private reg. total about 61$ for 5 years with private registration. $3.00 .COM w/ $1 Private Registration from GoDaddy.com! 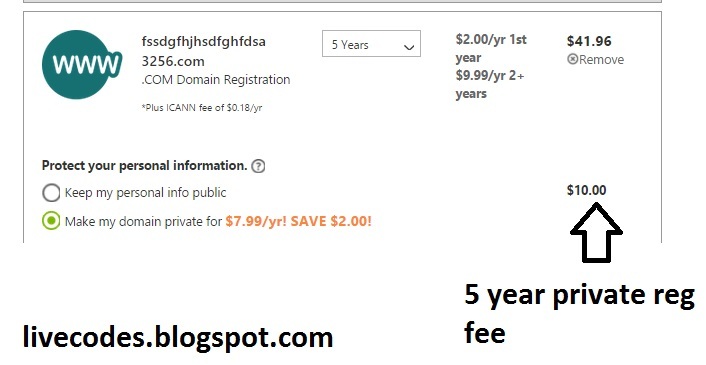 Price is for first year ,Additional years for domain is 9.99$ but my chart shows it is 14.99$ for additional years. Price is 4.99$ for first year . if you want to register for more years , price goes up ! $22.98 for 2 years. 11.49$ /year. Save 25% off $80 on new orders. 12$ a year Free domain + hosting. it tells 20% off but when i applied i see 31% off .